On April 4th, 2018, Representative Grace Diaz (D-Dist. 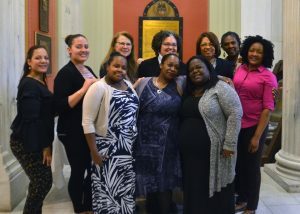 11, Providence) and Community Health Workers celebrated the passing of a House resolution to declare April as Community Health Worker month in Rhode Island. 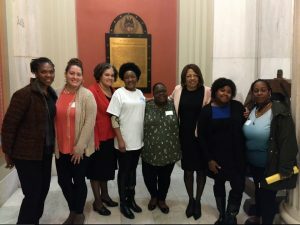 Rep. Diaz, herself a CHW, introduced resolution 2018-H 8047 to honor the dedication and accomplishments of CHWs in RI. Congratulations to all CHWs in Rhode Island for this honor! 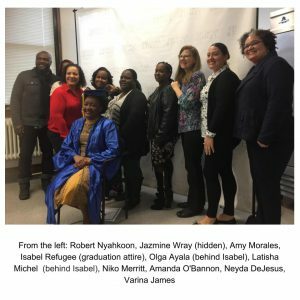 In January 2018, 10 community members from Rhode Island completed their coursework to become certified Community Health Workers in their respective communities. Their course consisted of 15 workshops, each lasting three hours, on topics including community capacity building, root causes of disparities, communication, cultural humility, co-learning, leadership, CHW ethical code, self-care and conflict resolution, home visiting and CPR. Armed with core skills prepared these CHWs, front line public and community health practitioners with the means to listen, hear, share and build themselves and their communities. CHWs create a bridge between providers of health services, community services, social agencies and vulnerable populations within the community. Community health workers are trained to provide basic health education and referrals for a wide range of services, and to provide support and assist in navigating the health and social services system while building capacity of individuals, their families and the community. CHWs with their peer -to- peer relationships are better positioned to see the assets of their community instead of only its deficits approach, which can be enhanced by their ability to perform community assets mapping – identify community resources. They are also positioned to perform data collection, which can be used to advocate for and with individuals and their communities. Community Health Innovations of Rhode Island (CHI-RI) began officially training CHWs in 2011, and since then have graduated over 50 individuals. With course and individual participant evaluations in progress, CHI-RI hopes to continue building its community-based and focused CHW course for to improve the community’s health. Building and developing communities has a health enhancing influence. A network of community oriented community health workers can build and enhance the capacity of underrepresented diverse communities. We will enhance community engagement and create more discussion on how social forces shape disparate health outcomes. Posted in What is new	| Comments Off on Saludos! See the latest newsletter Community Health Innovations of RI NewsApril2013. April is Community Health Worker Month! See Community Health Innovations of RI NewsFeb12. Read about CHI-RI’s receipt of a BlueAngel Community Health Grant. Also, see important CHW career path developments! See Community Health Innovations of RI News. Read about CHI-RI celebration of our first course completed. Also, see important legislative news for CHWs and Equity! We are excited to bring you our interactive website. You can sign up to become an Instructor of our comprehensive and well researched for results CHI Certification for Community Health Workers. We will be posting “what is new” and asking for your feedback. Look for more information in the upcoming months! In the meantime, tell us what you think will prepare the 21st century Community Health Worker given we want to move from a “sick” care system to a bona-fide health care support system.